Eight of Pentacle suggests that you are working very hard, not just at present, but over a long period of time. This is something that you find quite easy to do as you are completely dedicated to the task at hand and like nothing better than to get stuck into your work. You are bound to be crazy busy at present, mega productive and super industrious. It seems like you can make a success out of anything you decide to turn your hand to. Any obstacles that may have stood in the way in past are now history and you are free to pursue your course of action and any projects you may be working on. You are now at liberty to indulge your own interests and special projects too. There is a wonderful sense of coming into your own and feeling extremely confident about what you do. You work with a strong sense of purpose and life is feeling wholesome and worthwhile. Everything is falling into place and your two feet are firmly planted on the ground. This is a time for making excellent progress. 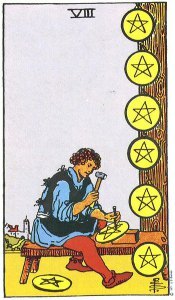 The Eight of Pentacles heralds success as a result of sustained and concentrated efforts. Your commitment and unrelenting effort has paid off and you are now in a very strong position. While others around you have been running around like headless chickens, trying this and that, you have kept your head down and hammered away on making progress in very specific areas. Where you are now is not a case of just being lucky for you have earned every cent of your success from serious application and self-discipline. This Card very often deals with finances and career but the success that accompanies this Card can be applied to any area of your life. Not only are you a success at what you do, but others see you in that light as well. You may see yourself as someone who is just getting on with their work but from the observer’s point of view, you are a role model and inspirational. One of your many outstanding qualities is the impeccably high standards you set for yourself and everything you get involved in. You believe that if a ‘job is worth doing, and then it is worth doing well’. You are scrupulous in your attention to detail and the quality of your work is excellent. The Eight of Pentacles suggests that you are highly qualified in your field of expertise and probably have attained other ‘above and beyond the call of duty’ diplomas and credentials. It is no doubt that you are ‘top of your field’ and ‘top of the class’. You would be considered an expert by your peers and someone who has vast experience behind them. You are highly sought after. Another of your qualities is patience, and when this Card appears, it will be asking you to take your time and not attempt to take any short-cuts with what you are doing. It is quality and not quantity that matters at the moment so you must pay attention to the fine detail and not just be in a hurry to get things finished and done. Only your best work will do and possibly even more is expected of you now, so do not disappoint. Keep hammering away until you get it just right. You have really come a long way and should be proud of your abilities and all that you have achieved. The Eight of Pentacles can act as a reminder to do something that you really enjoy doing. That something may be work-related, relationship, hobby, sport, travel or just about anything. When you love what you do, it will always shine through and work that is completed with love will stand out from the rest. The Pentacles are associated with the material world and the physical body so it is easy for them to get carried away with only caring for the Outcome. They can become workaholics, financially successful but dull and boring or health freaks who allow themselves no treats or rest. This Card however, brings maturity to the Pentacles Journey and carries a very strong message. The Outcome or Reward of course is important, and we all must set goals to work towards, but the journey to the desired outcome or goal is as important if not more. We must be able to look back on our journey once completed, with fond memories and pride. If you are not happy doing what you are doing then go out and find something that will. The Eight of Pentacles can suggest that you have very strong abilities or skills that you may not be utilizing to your best advantage. You may have a hobby; doing or making things in your spare time, which brings you great joy. You are probably self-taught, through research and reading up on your subject. Your work is more than likely exquisite but is possibly kept to yourself. The Eight of Pentacles can be indicating that you are sitting on a goldmine. It may be time to show others your abilities and skills by exposing it to a wider audience. The Eight of Pentacles is often a Card for study and learning and suggests that you may be working to add to your existing qualifications or getting re-trained. The Pentacles hanging on the Wall in the Imagery may be your proud display of Degrees, Diplomas, Certificates and Awards. This is not someone approaching their subject for the first time but rather someone who is interested in specializing in a certain field of expertise. This is someone who wants to be the best at what they do and become a Master of their trade. Education is important and you will be happy to add to it wherever you can; taking classes, courses or online study, anything really that will improve your existing skills and expertise. It can suggest that you are going back to college as a mature student or gaining extra qualifications through work. You may be planning to do or start-up something when you retire and are getting trained in that particular area. There is certainly a plan of action and you know exactly what it is that you are doing and want. An alternative message to the one above can suggest that it is time to push yourself some more. Even though you have worked consistently hard and are highly qualified, you have not fully realized your true potential. The Eight of Pentacles can appear to ask you to raise the bar even further to improve your performance, for you are well capable of it. You can do even better than what you have done to date. This Card can suggest that you might have reached a stage where you have platitude and are pondering over whether you need to do more or be content with what you have achieved. It is for certain that you are aware of areas, qualifications or skills that would be well worth adding to your repertoire, portfolio or CV. Whatever dream or ambition you may be considering chasing, it is well within your capabilities and reach. The Outcome will bring substantial gain for you. The Eight of Pentacles can also symbolically represent being awarded a Scholarship or being given the once-in-a-lifetime chance to study under one of the Great Masters. Go for it. Commitment to your community and environment is also very important and this Card asks you to help out wherever you can, especially using the skills and knowledge you have at your disposal. Think of what it is that you have or can do which might benefit others around you. Experience like yours is invaluable and you might be able to give someone a start by taking them under your wing. Don’t look at it as tedious or boring but more so as the opportunity to pass on your knowledge or legacy to those who come behind you. Take the time out to share your success with those around you so that they too may have the chance to be successful in their own right. Healthy and fit too, The Eight of Pentacles suggests you are paying much attention to your body and looking after its needs. Exercising, eating healthy and getting plenty of outdoors activity does take a lot of self-discipline but it’s no problem as you have it in bucket loads. The Eight of Pentacles confirms that you are or will be feeling very well and strong in mind and body. In fact you haven’t felt so well in a long time, but that is also because you are emotionally happy too. You are doing exactly what you want to be doing and you should be proud of yourself. However, financial security is also very important in your relationship, so you may be working hard to build a secure future for you and your partner or family. Make sure you remember to go home regularly and make some time for fun and social activities. The type of person you are leaves you exposed and vulnerable to becoming a workaholic. If you let this happen, then it may very well destroy your lovely relationship. You must work hard at striking the right balance. You can have both you know! With regards to career or business, the Eight of Pentacles is a very positive card and not only shows that you are working very hard and very diligently, but that you also love what you do. You are committed to your goals and ambitions and accept the hard work that is required to realize them. Those around you in the workplace turn to you for advice or to follow your lead. More people learn from you than you realize. In Business, The Eight of Pentacles can indicate that you are working flat-out at present and are constantly on the go. Orders and contracts are flying in with staff working overtime to meet the increasing demands and ensuring consignments are dispatched on time. You have no doubt built a reliable reputation for professionalism, quality and service within your industry and will be eager to build further on these. Keep up the good work. Should you be planning on starting a Business, then The Eight of Pentacles lets you know that you have the commitment, dedication and tenacity to make it a success. The success is in the detail of the business and that is where you excel. Getting down to the nitty-gritty, and painstakingly going through all the ins and outs, is something that most of us try to avoid, but not you. You are methodical in your approach and very resourceful. Knowing your subject or field of expertise inside out will be the key to your success. You might think of getting some extra qualifications to put you top of your game and in a league of your own. The Pentacles hanging on the tree can symbolize all your qualifications or displaying your goods for sale in a shop window. Maybe you are working on pieces of art or sculpture to exhibit in the local town. This card suggests that you have many qualifications, talents and abilities. If working on a project, entering a competition or looking for sponsorship your hard work and effort will pay off. The Eight of Pentacles is one of several Cards in the Tarot that put an emphasis on Community. It is a Card that appeals to your conscience and asks you to make a contribution or to give something back. If you are in a position to help others as a result of your success, then you should make an effort. Time spent in volunteering, mentoring or sponsoring those less fortunate, or individuals who show natural ability or skills, will be immensely worthwhile and rewarding.